Japan must quickly present to the rest of the world its blueprint for how the country will rebuilding following the devastating earthquake and tsunami a month ago and stabilize the troubled …nuclear plants. Reconstruction can and should be more than just restoring things to their previous conditions. 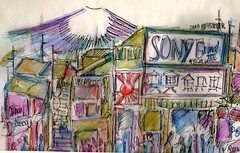 With creativity, the disaster could be an opportunity to enhance Japan’s strength. Other reports have indicated that many Japanese businesses are hobbled due to the outflow of foreign workers. Plus, the many homeless citizens are growing despondent about a lengthy stay in shelters. Thanks to Phil Palin for pointing out the Nikkei article.